Two family favourite flavours in one simple dish. Prepare Kraft Dinner as directed on package, using Sensible Solution directions. Meanwhile, brown meat in large skillet; drain, if necessary. Add Dinner and pizza sauce; mix lightly. Sprinkle with shredded cheese; cover. Cook on low heat 2 min. or until shredded cheese begins to melt. 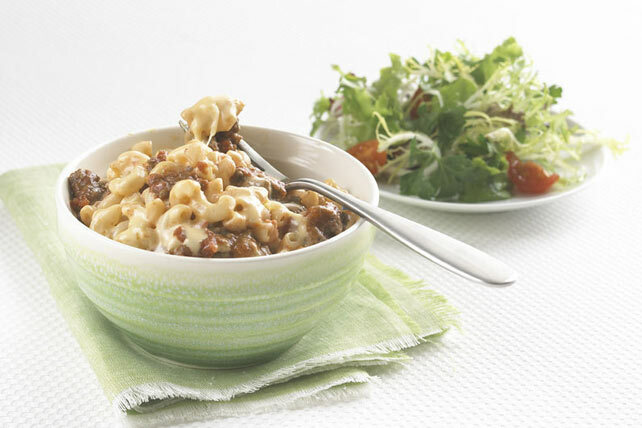 Serve with a mixed green salad tossed with Kraft Balsamic Vinaigrette Dressing.